Is a Man-Eating Salmon Lurking in a Chinese Lake? Tales from the Chinese Crypt is a regular web column exploring bizarre and creepy stories from across China. Famed for its rich cultural heritage and internationally renowned cuisine, Xinjiang resides in China’s far-flung northwest. One of the Middle Kingdom’s five autonomous regions, the territory’s landscape is a scenic patchwork of rivers, lakes, prairies, forests, deserts and imposing peaks. It’s also the supposed home of lake monsters. We first heard the tale of Xinjiang’s aquatic leviathans several months ago, while researching China’s best fishing holes. Although we can’t recall the source, the story we accessed made a passing mention of unknown creatures lurking in the depths of Lake Kanas, located in the autonomous region’s Altay prefecture. At the time, we made a mental note of the creepy story (because we simply love weird tales) and moved on with our investigation into China’s fishing hotspots. But the story popped back up again recently, in a report by the Guardian titled ‘Myth and majesty in China’s Xinjiang lake district,’ and we figured it was as good a time as any to explore the tale. Lake Kanas is located in a valley running though the Altai Mountains and is home to sizable populations of ethnic Tuvans and Kazakhs. In the Tuvan language, the lake cryptids are called hobzhk, which translates to ‘strange’ or ‘changing,’ according to the Guardian. Local lore contends that the freshwater beasts are tasked with maintaining the lake’s water level, by plugging a hole in the bottom to prevent its liquid contents from disappearing into the earth. While it is difficult to ascertain exactly how far back the Lake Kanas legend goes, we can assume at least 800 years, according to the Guardian, when Genghis Khan stationed troops at the lake to guard the creatures. Fast forward to the 1980s and Yuan Guoying, from Xinjiang University, reported seeing 50 fish that he assessed to be 10-15 meters long. The fish were reddish-brown in color and Yuan’s students estimated their weight could exceed 4 tons. In more recent times, a video surfaced in the mid-aughts showing unknown creatures cruising along the surface of Lake Kanas, the footage was aired by various Chinese news programs and can be viewed on YouTube here. On September 9, 2013, hundreds of tourists to the lake allegedly watched a creature for several minutes before it disappeared back into the depths. A 20-year-old tour guide quoted in the Guardian piece claims that farmers who have taken their livestock to the shore of the lake have returned later to find only skeletal remains. This claim is repeated on various online blogs and forums dedicated to cryptozoology. The same guide, named Xiao Yue (Little Yue), also dropped a suggestion as to what the animal might be, telling writer Sam Gaskin, “Technically, the hobzhk are huge fish that love to eat meat. Their scientific name is hucho taimen.” She added she believes the species are a danger to humans and that she cautions tourists not to swim in the lake. READ MORE: Is a Giant 'Death Worm' Lurking in the Gobi Desert? Yue's assessment of the creature is partially correct, by our assessment, in that we also believe the 'monster' is likely a taimen, sometimes more ominously referred to as the ‘Mongolian terror trout.’ Where she is wrong, is that human flesh is not on the menu for the taimen, the largest member of the salmon family. The taimen, similar to Yuan’s 1985 account, has a reddish-brown body, while its head is typically greenish-gray. It also gets big (although, we think 10-15 meters is a stretch), reaching lengths of over 6 feet and weighing up to 200 pounds. The largest one ever caught weighed in at 231 pounds. According to Gaskin, Yue claimed that fish “exceeding 12 metres in length have been caught on camera in Kanas,” although we were unable to find any evidence of this online. 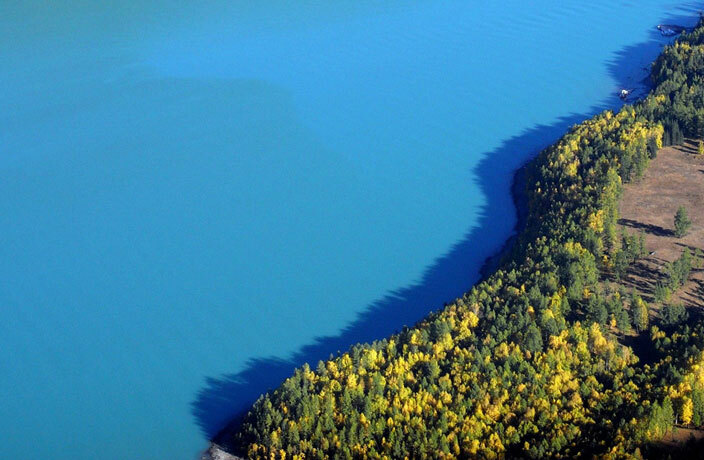 Located in northern Xinjiang, near the borders of Mongolia and Russia, Lake Kanas is also in the right geographical region for taimen, with both aforementioned nations boasting the only significant populations of the fish. There are, however, a few problems with assuming the species is responsible for the various Lake Kanas monster sightings. For one, taimen typically only live in rivers and, when they do appear in lakes, it tends to be near a tributary. The other issue is that the salmonid is extinct or near extinct in China due to overfishing, according to National Geographic. In July 2005, a team of divers was reportedly sent to search the lake for the monsters at a cost of RMB1.5 million. We presume they didn’t find anything, as no follow up appears to have been published. If the taimen does reside in Lake Kanas, it goes without saying that the animal is (probably) not responsible for killing livestock grazing near the lake – further removing it from the monster of legend. Still, all things considered, and removing the generic debunker explanations like unique wave formations and floating logs, the taimen is probably the most likely culprit for the sightings. But is a 12-meter-long, cow-eating salmon really lurking in the depths of Lake Kanas? Perhaps not. If it ever is discovered though…*dusts off fly rod*... we’ll be the first ones there! Interested in Chinese lake monsters? Click here to read about the Guai Wu, which are said to live Tianchi Lake, in China’s northern province of Jilin. Enjoy this story? Click here for more Tales from the Chinese Crypt. You may be familiar with the bigfoot and Loch Ness monster, but what about China's assortment of mysterious creatures? The circumstances surrounding this story have captured the imaginations of UFO investigators across the Middle Kingdom and beyond. ​With October being the scariest month of the year, it seems as good a time as any to dive into the Middle Kingdom’s eeriest folklore. Were Aliens Responsible for China's Otherworldly 'Sky Spiral' of 1981? A giant spiral in the sky, a spiral allegedly seen by 10 million people in Sichuan and Yunnan provinces. We look at some of the contemporary faces of modern-day romance in China. A battle is taking place on our very streets – where a game of sabotage and subterfuge is playing out between riders, vandals and parking officers. Plus, a guide to the Formula One x Asia. Does this garish pink building deserve its ghastly reputation?